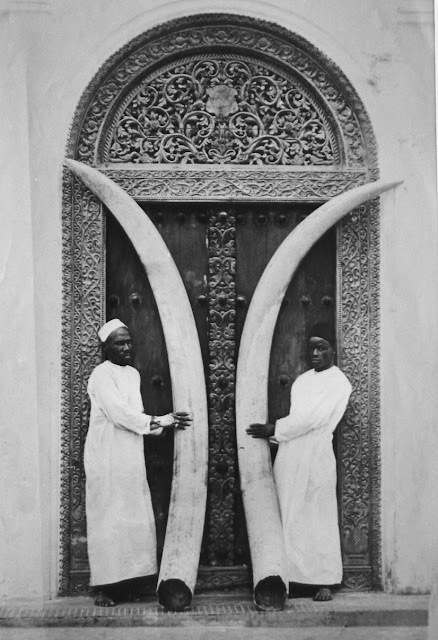 In WMD 'karamojo' Bell's 1923 book 'The Wanderings of an Elephant Hunter' he mentions a tusk in the 'South Kensington Museum'. About ten years later it was later reunited with its twin, and there hangs a tale. On our arrival at Mani-Mani we were met by one Shundi--a remarkable man. Karirono by birth he had been captured early in life, taken to the coast and sold as a slave. Being a man of great force of character he had soon freed himself by turning Mohammedan. Thence onward fortune had smiled upon him until at last he was, the recognised Tajir (rich man) of all the traders. Having naturally the intelligence to recognise the value of bluff and from his primitive ancestors the nerve to carry it off, he was at this time the greatest of all traders. Just as he had been a leader while slave-raiding was the order of the day, so now he led when ivory had given place to slaves as a commodity. One other thing that makes him conspicuous, at any rate, in my mind, and that he had owned the slave who who had laid low the elephant which bore the enormous tusks, one of which now reposes in the south Kensington museum. these tusks are still, as far as I know, the record. The one we have in London scales 234lb. or thereabouts. According to Shuundi his slave killed it with a muzzle-loader on the slopes of Kilimandjaro.